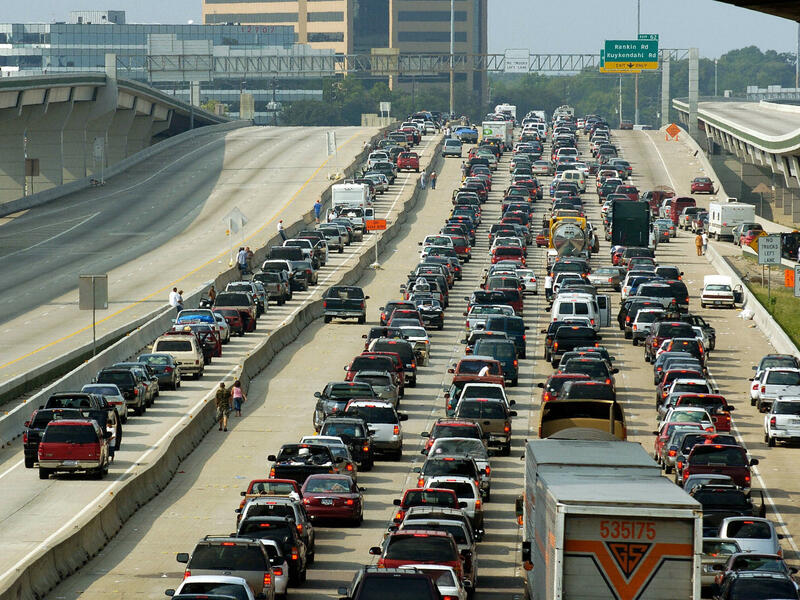 In September 2005, vehicles jam the northbound lanes of I-45 heading out of Houston, as the southbound lanes sit empty. Residents were fleeing Hurricane Rita, motivated in part by the recent horrors they'd observed when Katrina hit New Orleans. The decision has come under scrutiny. Harvey brought "unprecedented" amounts of rainfall to the region — and more rain is yet to come. Thousands of people have been rescued from floodwaters, and some 30,000 are expected to wind up in shelters. 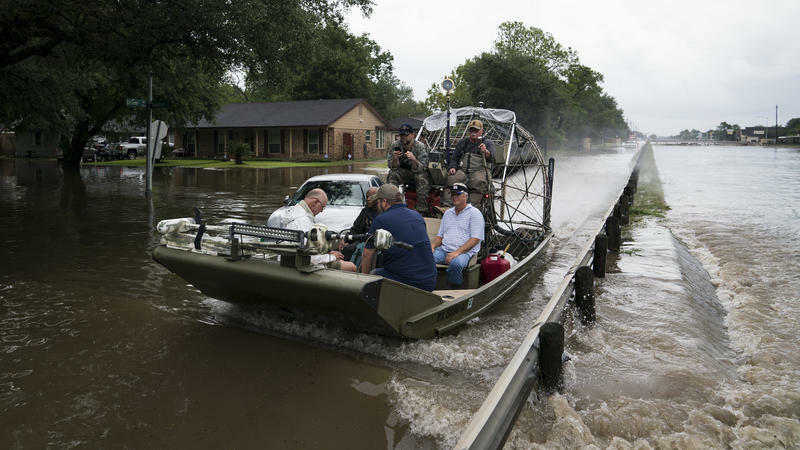 More counties and towns have issued evacuation orders, including a county just southwest of Houston, but the city itself has not. People outside the city, watching this unfold, have wondered why — some quietly, some loudly. Why were all those people home in the first place? Why were officials wary of calling an evacuation? There are multiple reasons, but one good place to start is on a scorching-hot, utterly gridlocked freeway more than a decade ago. In 2005, just a few weeks after Hurricane Katrina devastated New Orleans, Hurricane Rita made its way toward Houston. Rita was even stronger than Katrina — and Houstonians had just witnessed what happened to New Orleans residents who decided to wait out the storm. Nobody wanted to repeat that mistake. The result: The largest evacuation in U.S. history, according to PBS. Texas legislators estimated that 3.7 million people left the Houston region in the evacuation effort. "In searing 100-degree heat, cars crept up north I-45, windows down, air conditioning off to save precious gasoline. The traffic jam stretched for over 100 miles and has been going on for over a day and a half. ... Gasoline was not to be found along the interstate and cars that ran dry made the gridlock even worse. Abandoned vehicles littered the shoulder lanes." Dozens of people died on the road — in a horrific bus fire, in traffic accidents, of heat stroke. After all that, Rita changed course and dealt Houston only a glancing blow. The direct death toll from the storm itself was fewer than 10, a fraction of the death toll of the evacuation. And many people who suffered through days of misery returned home to find houses barely touched by the storm. Texas officials analyzed the debacle and noted ways to improve highway conditions during mass evacuations (for instance, by planning earlier to convert freeways to run in only one direction). But the specter of Rita still looms large as a worst-case scenario for a vast city like Houston. "You literally cannot put 6.5 million people on the road," Mayor Turner said Sunday, explaining his decision not to call for evacuations. "If you think the situation right now is bad, you give an order to evacuate, you are creating a nightmare." Even without a Mad Max situation on the roads, evacuations aren't undertaken lightly. For the poor, evacuations can be untenably expensive; for people with disabilities, they can be impossible. City officials contemplating a mandatory evacuation must also consider residents of nursing homes and patients in hospitals, who might be put at immediate health risks if moved. And then there's the question of where people are going to stay while they're gone. And Houston officials said an evacuation that's too broad can slow down the people who need to get out, as the roads fill with those who could have been fine staying in place — for instance, if Houstonians caused gridlock for residents of even more vulnerable small towns. Local leaders also emphasized that being on the road isn't always safe — particularly in a flood situation. In the case of Harvey, Houston officials say their decision not to call for evacuations was influenced by the fact that they were looking at a "rain event." That is, they weren't bracing for a hurricane's storm surge and high winds — instead, they were looking at lots of rainfall. That meant a greater level of uncertainty about what areas would be the hardest hit, officials said. "If we wanted to call an evacuation, we wouldn't even know where to call it, 'cause we don't know where the rain's going to fall and which watersheds are going to be affected," County Judge Ed Emmett said at a news conference Friday. The lack of high winds and storm surge also suggested to officials that people might be more at risk on the move than in their own houses, even if water breached their doorsteps. Attempting to drive through flooded streets is a common cause of death during heavy rainstorms. "This is a rainmaker for [Houston]," Turner said Friday. "There's no need for people to be thinking about putting themselves in greater danger." 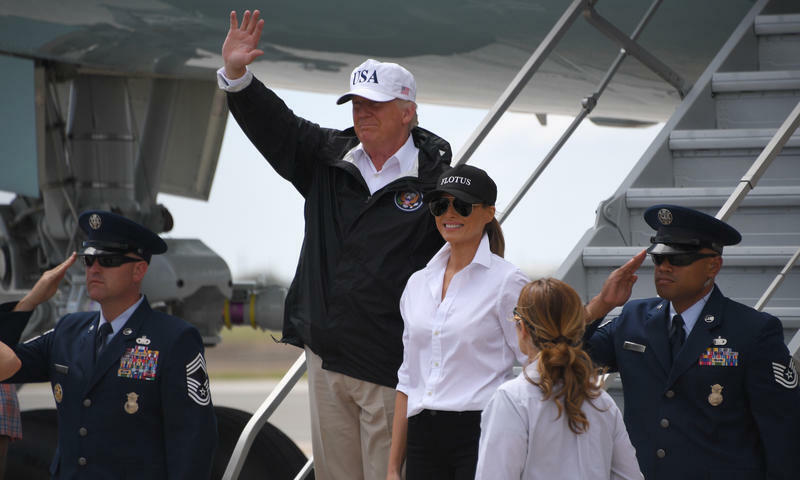 With an evacuation that's not planned far in advance, "you are literally putting people in harm's way, and you're creating a far worse situation," he reiterated Sunday. As waters rose over the weekend, officials reminded residents that having floodwater inside their house was not necessarily a life-threatening situation. But at some point, of course, those floodwaters do become deadly. If lower floors flood completely, Houston's Office of Emergency Management cautioned, residents should never take refuge in the attic unless they have a way out. They could risk being fatally trapped. Now, days into the storm, there's more rain in the forecast and high-water rescues are continuing. On Monday morning, a mandatory evacuation order was issued for parts of Fort Bend County, to the southwest of Houston. Voluntary evacuation orders are posted in some cities in Harris County, which includes Houston. But there are still no evacuation orders or advisories in the city of Houston proper. The city is focusing on "critical" rescues and advising everyone to remain off the roads. Turner stood by his decision in a news conference on Sunday night. "It was in the best interest of Houstonians," he said. "It was the right decision in terms of their safety and always we must put the interests of the city and Houstonians first." The head of FEMA, Brock Long, "did not question the decision," Reuters reports. Long said on Monday it would take "literally days" to evacuate Houston. And Gov. Abbott, for his part, told CBS on Monday that there's "no need for us to relitigate that issue."